Alien Armory Tactical is your local, family owned and operated full service gun shop. Located in Charles, MO and easily accessible to anyone in the Greater St Louis area. We have a wide array of firearms and firearm parts & accessories. We specialize in AR parts and accessories and all of our products are designed and built by us or selected by us for their affordability and quality. We appreciate the confidence our customers have in us and we look forward to earning your business in the future. If you have any questions or comments please let us know how to best contact you and we will get back with you as quickly as possible. Alien Armory Tactical offers full-service gunsmithing services. From simple cleaning to major repair, we have your back. Our highly skilled professional craftsmen and support team take great pride in performing the art and science of gunsmithing. We offer an extensive range of services at our St Charles area gun shop to help keep you in the field or on the range. Our gunsmiths excel in a wide variety of services such as stock fitting, wood refinishing, metal restoration, accessory additions, and special performance enhancing projects. 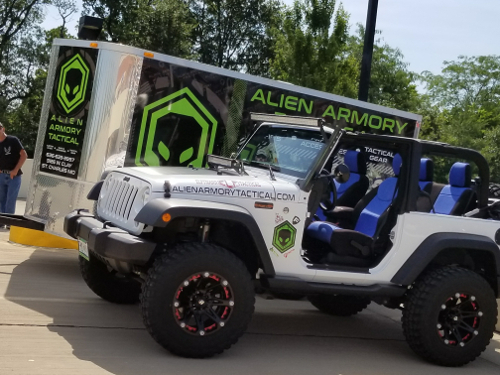 At Alien Armory Tactical we’ve got it all right here in the St Charles area! AAT was created by people with a passion for firearms, tactical gear, and the great outdoors. Our goal is to give you access to everything you need from AR parts and Accessories to targets and ammunition. No matter what you’re searching for we’re here to help you gear up for the big hunt, add to your collection, or to help wit self defense and range shooting. At Alien Armory Tactical You Can Shop a huge selection of tactical gear, firearms, ammunition, accessories and especially our AR parts and accessories.